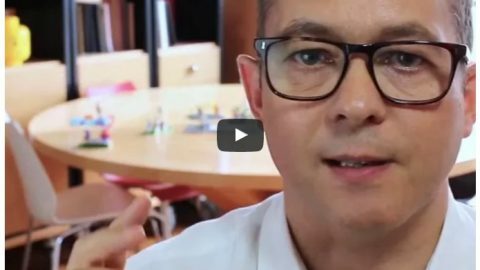 Lego bricks extend their role as a play toy to contribute to design thinking inside large organizations through the Lego Serious Play tool. Design thinking is an essential process for companies who would like to lead the market through creativity and innovation. The target from the process is to build a solid understanding of the problem in order to reach creative solutions. However design thinking is a complex process which combines both logical thinking and creative imagination in order to build innovative products and services. Therefore, many tools are involved to help facilitate the design thinking process between teams in companies and students in schools as discussed in applying design thinking in education. These tools include issue cards, group sketching, role play, design games and Lego Serious Play. 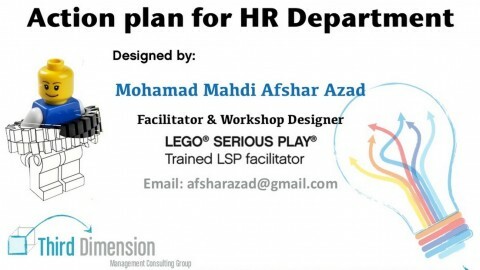 The Lego Serious Play is one of the tools that implement Lego bricks in the design thinking process to help generating innovative ideas and solutions. 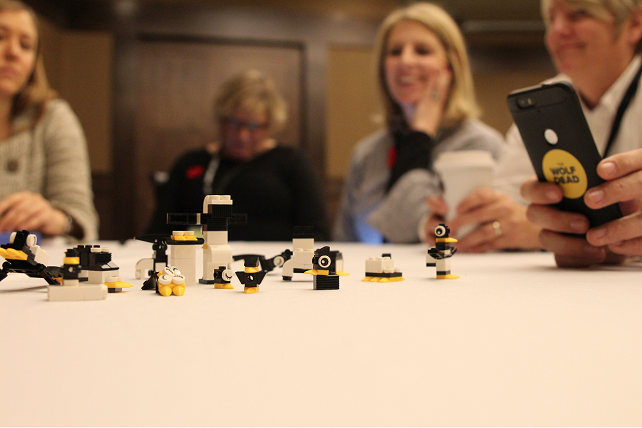 Using Lego bricks and characters, the team share ideas within the context of organizational strategy. 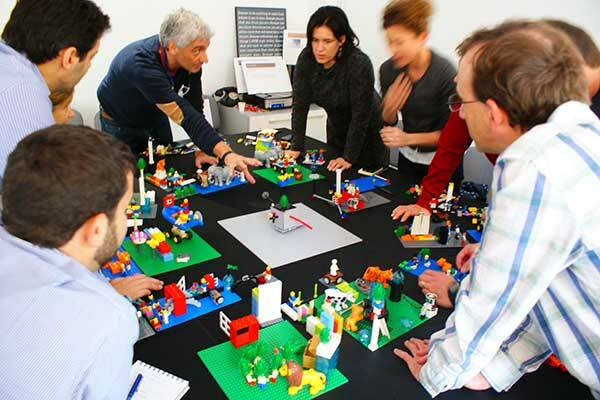 The Lego Serious Play is used during team meetings to communicate visually through a storytelling model. The meeting facilitator goes through series of questions that aim to provide a better understanding to the problem. The team members build their own Lego characters and elements based on the provided questions. These models serve the discussion to establish the flow of knowledge and thinking, to solve problems and take strategic decisions. 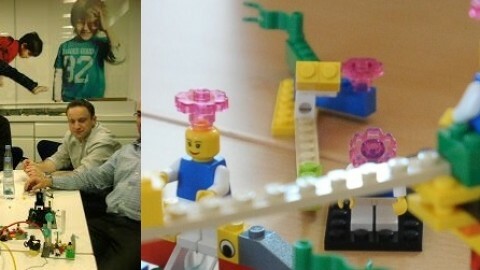 The Lego method encourages participants to learn and listen to others in the group. Each participant has a voice and shares ideas equally with the whole group. The process requires a trained facilitator. Why using Lego Serious Play bricks? Building quick prototype of ideas. Each team member creates the core model using the basic bricks and starts to add, enhance or modify it as creative thinking flows. This visual presentation contributes a complimentary understanding of the idea and modifies it during the storytelling process. Visualizing the ideas into a model eliminates the fear of failure as it is treated with a prototype that can be modified during the design thinking process. Visualizing ideas in the 4D space. While the Lego bricks gather to build 3D models, moving these models and modifying them adds a fourth dimension, which is time. As the models change during the storytelling, the business scenario and innovative strategies are changed accordingly. An open platform is used for everyone’s contribution. This model is open for everyone to share ideas and contribute in making decisions. This collaborative scenario helps building with other’s ideas and contributes to a better understanding to the challenges. 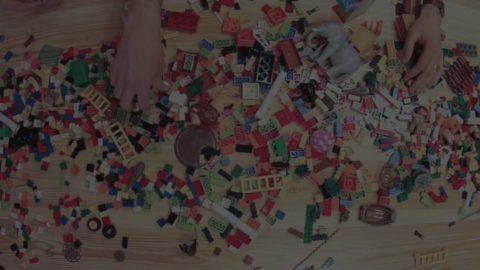 The Lego Serious Play can be applied to wide range of disciplines, including building a team, process related and innovative thinking, solving problems, sharing strategies and training teams inside companies for creative thinking. Each Lego Serious Play group should include 4-8 participants to ensure the focus and getting the most out of the discussion. Each group should be assigned a facilitator who is responsible for creating challenges, managing group dialogue, ask questions, as well as, help participant to share ideas. Each group depends on each model which reflects the answer for the challenge. During the discussion, there is no wrong or only right answer. The models are simply tools for the discussion. While the look of the model is significant, the meaning reflected by each model is the most important. Before starting the process steps, a warm up stage should be applied to help participants to use the bricks to unleash their creativity. While putting the brick in front of the team the facilitator can push them to start playing with it. The facilitator asks the team to build simple shapes such as a duck or stable tower. Question: Introduce the challenge and ask questions related to the problem which needs to be solved in order to start the discussion. For example, the challenge can be building a model that reflects the strength inside the product or the organization. Metaphor: In this step, the participants build the models that reflect the challenged described in the first step with the ability to describe each part of the model. Sharing: In this step, each participant shares their thoughts and ideas about the challenge and how it is visually reflected to the challenge. Questions: In this step, the facilitator asks questions and the groups share experiences in order to build a solution for the model based on thoughts discussed during the process. Many tools help companies and organization achieve the goal behind the design thinking process. One of these methods is the Lego Serious Play. In this method, the design thinking group uses the Lego bricks to build models that reflect challenges and find solution for problems. 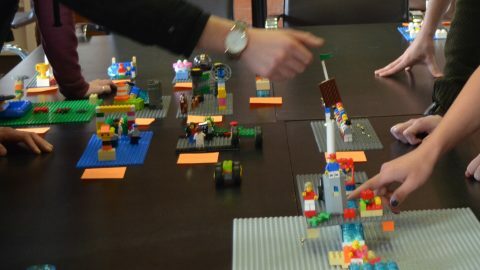 Unlike the other methods that may be boring for the participant, the Lego bricks can turn the discussion into a real challenge with fun and joy. 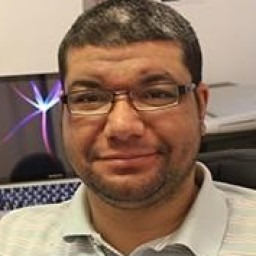 Rafiq Elmansy is design lecturer at the American University in Cairo, author and design manager. His experience includes more than 15 years in the design industry. His design creative work is exhibited in many locations including Croatia, South Africa, and Spain. 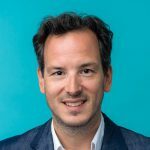 He is also a jury member and mentor in acknowledged design competitions and published author for John Wiley, O’Reilly Media and Taylor and Francis. I’ve been asked to facilitate a design thinking session with LSP (8 participants, approx. 4 hours duration). Could you advice me on what LSP set to use for this session? Would you just use only the Starter Kit (1 per person) or also the Identity and Landscape Kit?